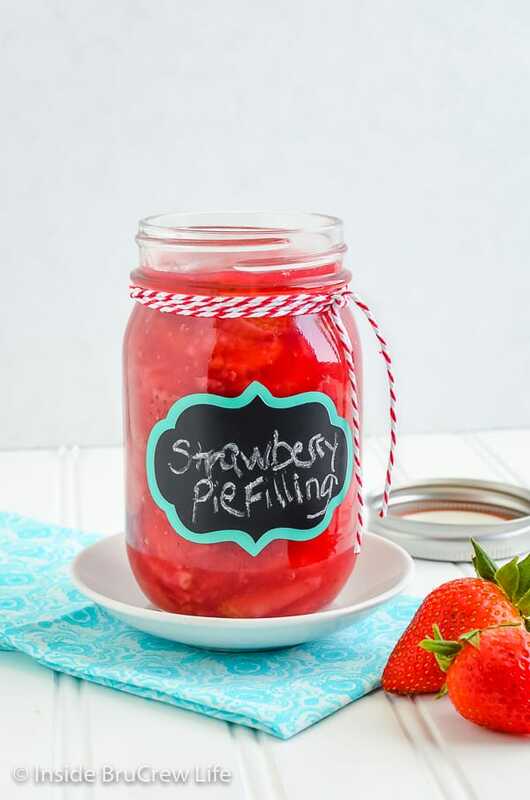 It only takes a few minutes to make and then to enjoy fresh Homemade Strawberry Pie Filling. It is perfect for pies, cakes, breakfast pastries, or spreading on toast. With spring finally getting here, I am looking forward to lots of fruit. One thing I always loved doing with our kids when they were younger was to go strawberry picking. There is nothing like a fresh strawberry on a warm day! Sadly, the kids don’t share my enthusiasm for going anymore, but that doesn’t stop me from making them go with us from time to time. It’s about family time, and those cute photo opportunities. Now that we live in Florida, I have to remember that strawberry season and strawberry festivals are much earlier in the year. I missed it again this year, so I’ll have to settle for buying strawberries in the store or at the farmer’s market. Berries do not last very long in our refrigerator. We have some berry monsters who will eat an entire box if I’m not watching. I am so glad our kids love to eat fresh fruit and veggies. So when I bought a new big box of strawberries, I had to make sure everyone knew they had to wait to start munching. These berries had a pie filling destiny. Pie filling is actually easier to make than you think. Sure, you can buy a can of strawberry pie filling at the store if you like paying for cans full of gel and very little berries. This pie filling is easy to make, and it doesn’t take much time at all. Start with 5 cups of sliced (or diced) berries. 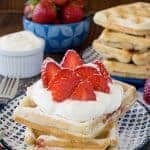 You want to make sure there is plenty of strawberries in your filling. Water, sugar, and cornstarch gets boiled into a gel for coating the strawberries in. Add the berries and simmer for 3 minutes. 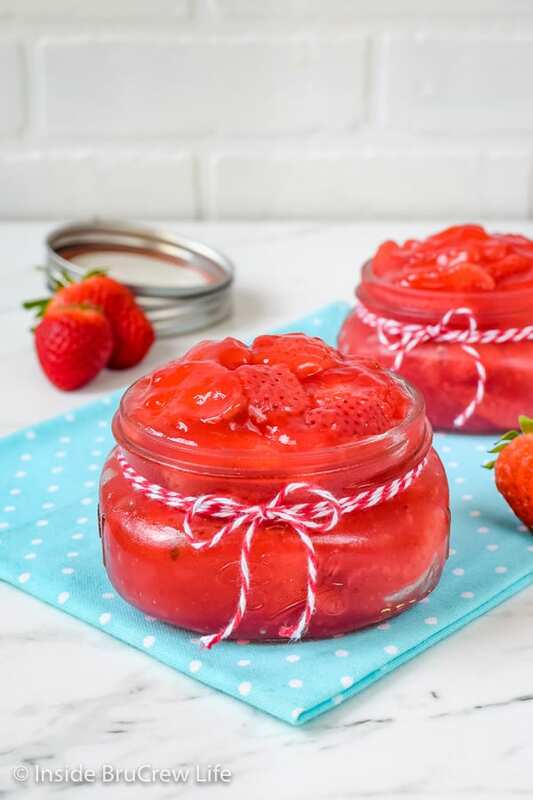 Pull the pan off the stove and stir in some strawberry Jello powder to thicken it even more and to give it a bright red color. Now comes the hard part. You have to have patience and wait for the homemade pie filling to cool off. It needs to cool off enough for you to put it in your refrigerator for a few hours. This will give it time to thicken up a little bit more. Making it the night before is an easy way to have it ready to go the next day. 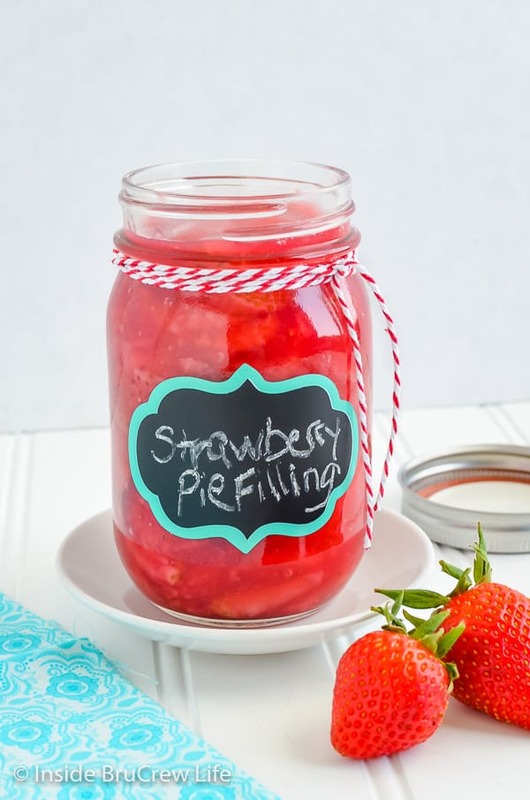 What can you make with the best strawberry pie filling? 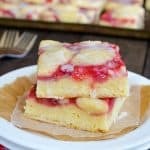 This delicious Strawberry Lemon Snack Cake is a delicious way to use up extra pie filling. 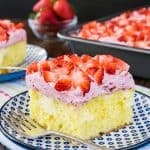 An easy Lemon Strawberry Poke Cake is a refreshing and light dessert for hot summer days. Swirls of strawberry pie filling, creamy cheesecake, and fudgy brownies makes these Strawberry Cheesecake Brownies the best kind of dessert. A pan of this easy Strawberry Chocolate Cinnamon Roll Bake is a delicious treat for breakfast or brunch. Can you freeze homemade strawberry pie filling? Yes, it freezes just fine. Thaw it overnight in the fridge before using it. There may be a little bit of extra water on top from thawing it, but you can pour that off easily before using the pie filling. 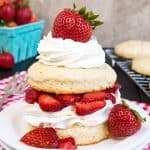 Can you make this strawberry pie filling without cornstarch or Jello? Both of these ingredients help to thicken and stabilize the fruit filling. 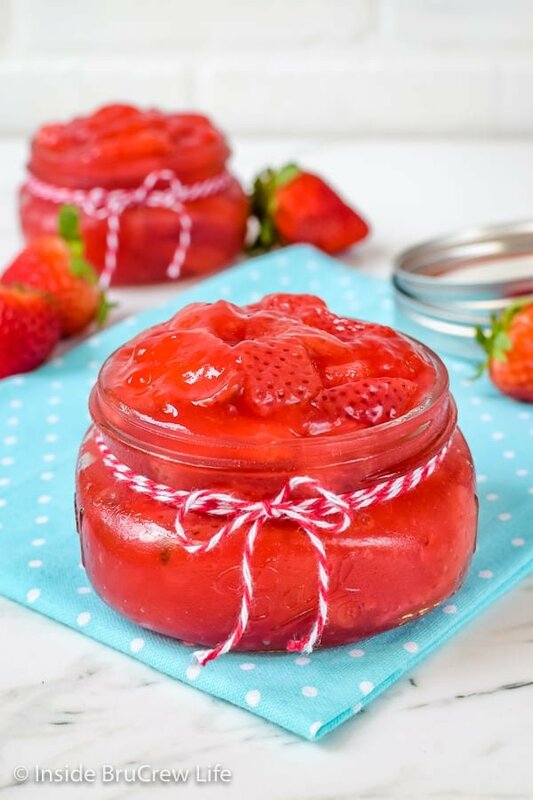 If you are looking for a strawberry pie filling without cornstarch or Jello, you may enjoy this Honey Lime Strawberry Sauce. Swirls of strawberries and graham cracker crumbs give these Strawberry Cheesecake Milkshakes a fun flair. Awesome frozen drink on a hot day! Make a batch of this Strawberry Crisp Ice Cream for dessert. 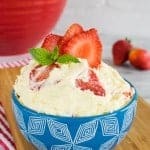 Homemade vanilla ice cream filled with chunks of strawberry crisp is a frozen treat that no one will forget. 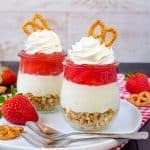 The sweet and salty crust on this Strawberry Pretzel Pie makes this easy, no bake pie a delicious spring or summer dessert. Stir together the strawberries and lemon juice. Set aside. Whisk the sugar and cornstarch into the water in a large saucepan. Bring to a boil. Boil for 1 minute. Stir in the strawberries and simmer for 3 minutes. Remove from the heat and stir in the Jell-O powder. Let the mixture cool on the back of the stove or counter for 1-2 hours, then refrigerate until chilled all the way through. Keep refrigerated in a sealed container for 4-5 days. It can also be frozen if you want to keep it longer. 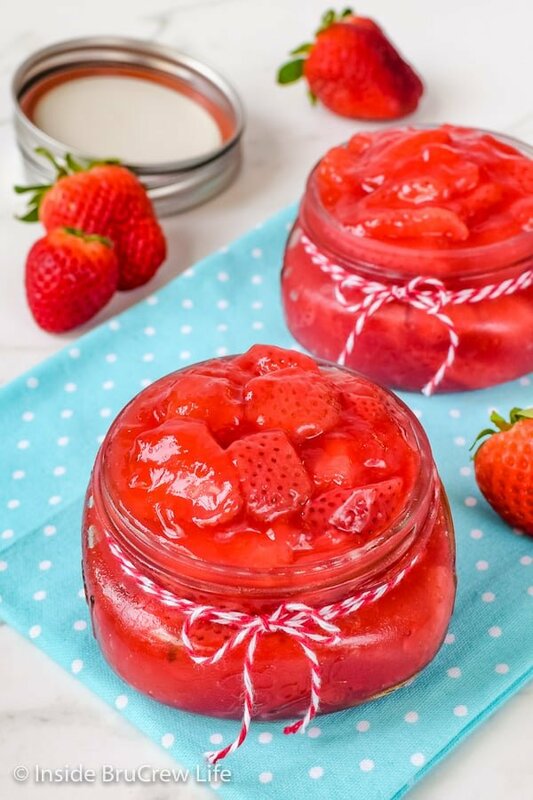 *The post for Homemade Strawberry Pie Filling was first published on March 22, 2014. The photos and post has been updated and republished on March 19, 2019. Fresh fruit filling beats canned any day! I can’t wait to score some major points with my strawberry-lovin’ fella. I can just picture this with oodles of whipped cream on top. omg, yes! SO springy and perfect! As a pie filling or drizzled on stuff – this made my mouth water! YUM! PS – that Strawberry Cheesecake Brownie looks pretty amazing, too! Love this idea! Strawberries are my favorite! I love these photos Jocelyn! They’re gorgeous! I just loveeee strawberry filling! this is a great recipe Jocelyn and I can’t wait to try it! 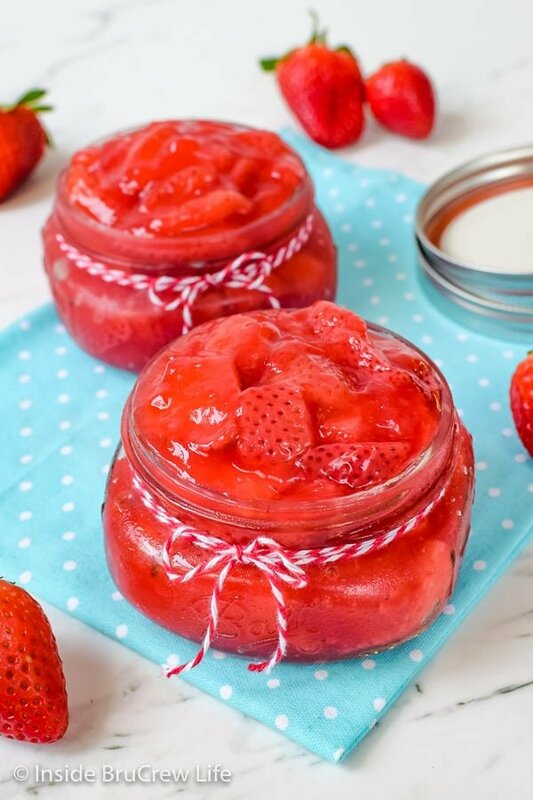 I make a strawberry sauce and remove all the seeds, use it to make Lava Flow drinks and it is good! Did you see my post on Hot Fudge cake? Mmm Pie Filling = pie season!!! My daughters are at the age where they love berry picking. We took them Raspberry picking last year and it was so much fun! We’ll need to do some strawberry picking this year. BTW-love the cute little labels for the filling! Totes adorbs!! I know fresh berries would be best, but…do you think this recipe would work with frozen berries. I have a big bag in my freezer that I need to use. LOVE you pics and recipes! Thank you so much! I have not tried this recipe with frozen berries. I know as the berries would thaw in the pan, they will release more water which would affect how the filling would set up. My thinking is that you could put the frozen berries in a big saucepan and bring them to a boil with just the water that they release. Then stir in the cornstarch and sugar and maybe a little bit more water. Because frozen berries tend to be mushy when they thaw, you won’t need to simmer it as long. I know that is all kind of vague…I hope that helps! This looks amazing and I’d like to have some on hand year round. Have you ever canned it? Oh, no!! I’m not sure why it would have done that for you. I am going to remove that from the recipe until I can make and freeze it again. I am so sorry it did that for you!!! I have slightly changed the recipe and tried freezing and then thawing the filling and it worked just fine for me. There was a little extra liquid after it thawed, but I just poured that out. The filling itself was still delicious, and I was able to use it in another recipe. Thank you… I was really wanting to make extra jars, and freeze some but this answers my question…. thanks again. I froze a small container of this the last time we made it, and it was still great after thawing it overnight in the fridge. There was a little bit of extra water from thawing it, but I just poured that off. The filling itself was still delicious and worked great in another recipe. Just read the comment for the freezing… thanks…. will let you know how it does, I am going to freeze one pint. In the Strawberry Pie Filling recipe, there is salt in the ingredient list, but not in the directions. When do you add that? That has to be a typo because I have never added salt to it when I have made it. Thank you for letting me know. I will correct the recipe. Jocelyn, thank you so much for this recipe! Last week I was making a dessert that called for cherry pie filling, but I wanted to use strawberry. When I did a search, I found this recipe and knew (because I’ve come to completely trust your recipes to be great!) that it would be wonderful. And it was. I did use frozen strawberries because I had bags of them that we picked this summer. What I did was to partially thaw the berries enough so they could be sliced. Then I sliced them, measuring 5 cups of sliced berries, and used them in the recipe, following the directions as given. You’re right, it didn’t take as long to cook the previously frozen berries. The recipe came out perfectly. I let it cool at room temp for several hours, then put it in a container to chill overnight before using it in the recipe. Thanks again, so much. The dessert turned out great. How many ounces of filling does this recipe make? Generally a 21 ounce can of pie filling from the store measures 1 1/2 cups. So, since this recipe makes 4 cups of filling, it would be about 56 ounces, give or take. What are you trying to make with it? I was thinking about making a strawberry cream pie, but it only requires 21 ounces of filling. Do you have any recommendations on making a smaller volume of the filling? Looks great! quick question; how many 9 in. pies does this fill? Do you think it would work for a cheesecake topping? How long do I can it in a hot water bath ? I have actually never canned this recipe. The recipe doesn’t make a lot, so we usually eat it all in a short time. Keep me posted if you decide to can it. I have never canned this before. We just use it up right away. Not only is this delicious but it’s also the cutest strawberry pie filling ever!! I love how easy this is. Delicious! Thank you so much for the tips! This is very helpful! What a delicious idea! I can’t wait to try this. I love strawberries! Add the berries and simmer for 2-3 minutes. Stir in the strawberries and simmer for 3-4 minutes. Hoping to hear back & corrections are made. You can actually do either and it would be fine. Most of the batches I did were about 3 minutes, but I did a few at 2 and a few at 4, and it didn’t seem to make a big difference. Thanks for the heads up that I had two different times listed. That was my mistake, and I’ll get it corrected.